This is one view of the same belt featuring the golfing ladies navigating around their golf course, over the creek and on the greens. The following view is of the same belt, but of the girls hanging around the snack shack. When ordering, designate #00712. You'll receive the entire strip which includes both scenes. 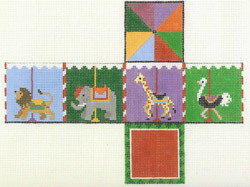 6 squares which when folded and finished form a 4-faced cube with the merry-go-round square on the top and the red floor, blank for initials or date, on the bottom. Loop hangs from the point on the top. This is so darling; a one dimensional flick hardly does the finished product justice. 6 squares which when folded and finished form a 4-faced cube with the star square on the top and the dove peace symbol on the bottom. Loop hangs from the intersection of the points in the center. This is so darling; a one dimensional flick hardly does the finished product justice. A gingerbread house cookie ornament with domed roof, enhanced with Mill House mini bugle beads (included)to simulate candy sprinkles. 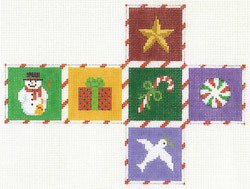 Gumdrop shrubs, lollipop trees, candy cane columns, Hershey kisses mini-shrubs, Hershey bar door and pin wheel lamp posts. The detail and ingenuity in this project is extensive and unique. Yours for many a hour of creativity! A red velvet gingerbread house ornament with a butter-cream iced roof embellished with glass sprinkles (included) to simulate pecan or walnut chips, green candy-cane posts, donut windows, hershey kisses bushes, candy bar upstairs windows. The temptatio to nibble on thisgingerbread house ornament is almost too powerful! Don't these Santas warm the cockles of your heart? 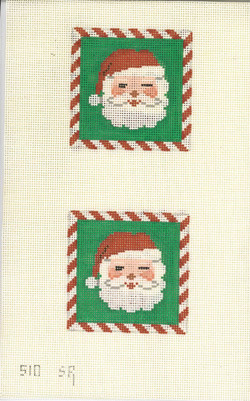 These faces are 2 of 4 squares which when finished will be based with cork to prevent moisture or, if an ornament, will be backed with a red plaid and looped from one of the corners. These Santas are so cuddly it's hard to reject them. So don't! 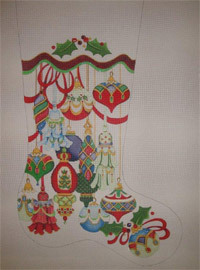 On #12 mesh this 7" x 14" striped stocking should appeal to your furry feline. What self-respecting kitty wouldn't adore the stripe with 2 mice, or a stripe with a big, fat plump gold fish? The toe features a eye-catching pink and red ball of yarn to get tangled in. Room on cuff for name. 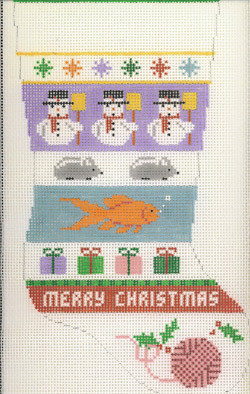 This stocking is surely to be an heirloom featuring a very detailed garland of Santa's train. 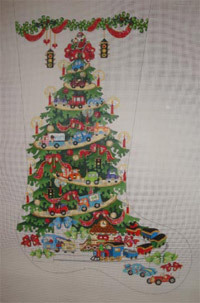 Christopher Radko would be so envious of your needlepointed garland! 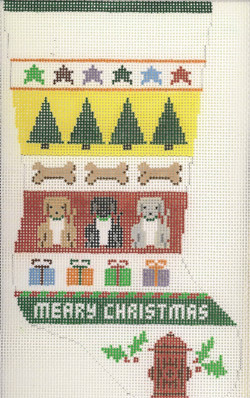 On #12 mesh this 7" x 14" striped stocking should appeal to your furry canine. What self-respecting puppy wouldn't adore the stripe with 2 bones, or a stripe with friendly companion pups? The toe features a red fire hydrant on which to leave his "mark." Room on cuff for name. What a magnificently elegant and elaborate stocking for someone who has outgrown teddy bears, choo-choo's and ballet slippers. This is a beautiful heirloom to be cherished for scores of Christmases, maybe even more than that! A log cabin house ornament of tootsie rolls with a graham cracker roof, candy cane lamp post, and lime gumdrop Christmas trees. Which is better...to hang this ornament or to eat it?